Figure 5. Effect of c-MYC on post-stasis HMEC growth and TRAP activity. Top panel: schematic representation of protocol to directly target senescence barriers to achieve non-clonal immortalization. Middle panel: Pre-stasis 184D and 240L HMEC grown in M87A+CT+X were transduced at 3p with a p16sh-expressing retrovirus (MSCV, blue) or empty vector (black). At 4p cultures ±p16sh were transduced with c-Myc (BH2)(red +p16sh; purple -p16sh). c-Myc-transduced p16sh post-stasis HMEC maintained active growth indefinitely, associated with increased TRAP activity. 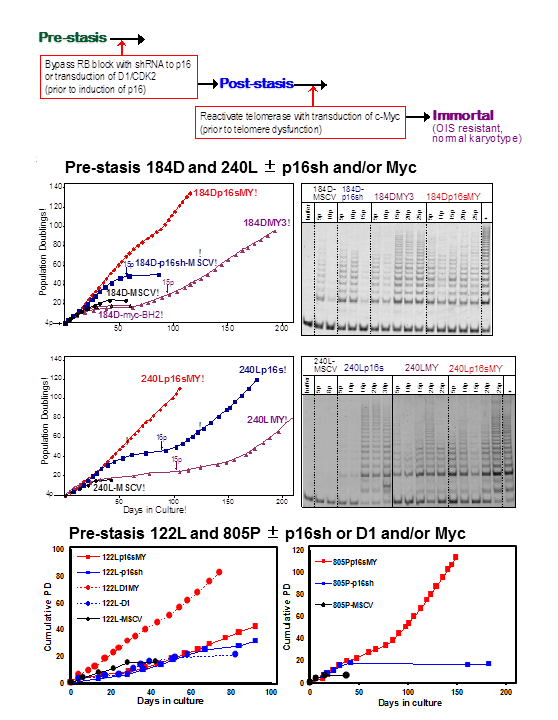 The continuous exponential growth following c-Myc transduction of the 4p p16sh-post-stasis populations reflects the observed non-clonal immortalization. Cells transduced with p16sh alone bypassed stasis and ceased net growth at agonescence, with rare clonal immortalization at agonescence. Cells transduced with c-Myc alone ceased growth at stasis, with rare clonal escape from stasis leading to immortalized lines. Control cultures transduced with empty vectors ceased growth at stasis. In some TRAP assays, heat-treated controls (+) were run next to unheated (-) samples. Positive TRAP control samples are indicted by “+”. E. Bottom panel: Pre-stasis 122L and 805P HMEC grown in M87A+CT+X were transduced at 3 or 4p respectively with a p16sh-expressing retrovirus (MSCV, blue), D1/CDK2 vector (blue dotted line) or empty vector (black). At 4p or 5p cultures ±p16sh or D1 were transduced with c-Myc (BH2)(red +p16sh; red dotted +D1). c-Myc-transduced post-stasis HMEC maintained active growth indefinitely. Each point indicates a passage.